In this fast-paced world, there’s nothing more heart-warming during the holidays than to slow down and enjoy a small town, old fashioned Christmas. And no one does it better than historic downtown Golden. This classic, all-American town has a main street out of a Christmas movie with three holiday parades, a cherished Candlelight Walk with carolers, chestnuts and hot cider, and a grand illumination with thousands of lights twinkling on the trees along the banks of Clear Creek. Add dozens of shops and festive decorations and you have the makings of an Olde Golden Christmas to remember. And did we mention FREE Parking? Here are just some ways to start a holiday family tradition in Golden. 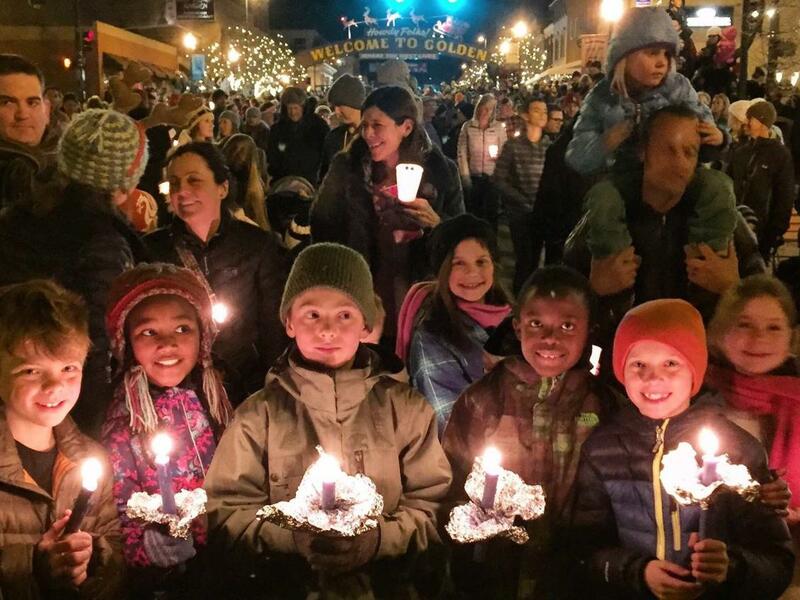 Candlelight Walk, Dec. 2, 6:30 p.m. Golden’s main street is closed to traffic and thousands upon thousands of people walk down it carrying candles, singing carols and enjoying hot cider. 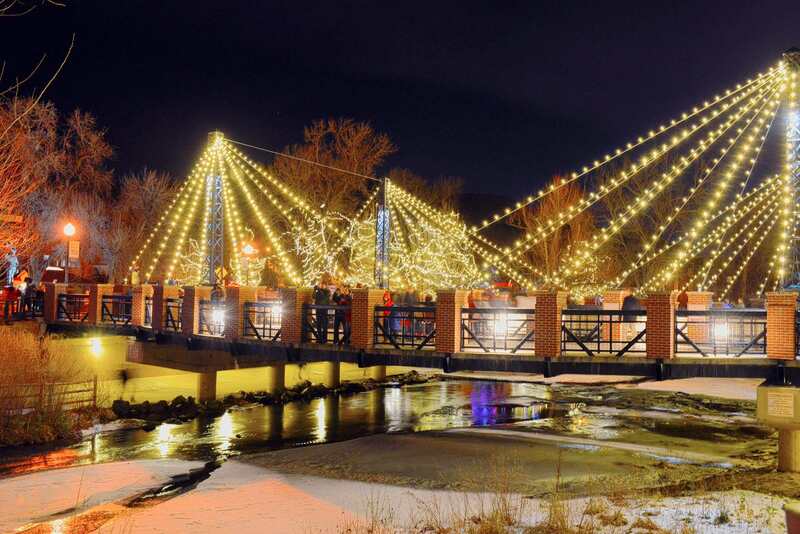 The walk starts at 6:30 p.m. at the Foothills Arts Center and proceeds down Washington Avenue to Clear Creek, where thousands of lights twinkle along the bike paths and bridges lining the river. With nothing but the sound of the creek and the lights overhead, it is a true Colorado mountain town spectacle – all just 12 miles from downtown Denver. After the walk, visit the historic buildings at the Clear Creek Historic Park by candlelight, or stop and say “Hi!” to Santa at the Golden Visitors Center. Golden hosts not one, but three holiday parades, all starting at 10:30 a.m. on Saturdays. Come and enjoy free downtown parking as you watch cowboys on horses, colorful floats, marching bands, antique cars and fire engines, elves on unicycles, the Grinch in his corvette, and of course, Santa Claus. The parade winds down Washington Avenue with lots of activities before and after including snappy barbershop quartets, hot cider, and Victorian carolers. Presented by the Golden Chamber of Commerce. Shop Main Street and Take a Picture Under the Famous Arch -- Golden’s 58-foot long Welcome Arch is one of the most photographed sights on the Front Range. The sign has been saying “Howdy Folks!” to visitors since 1949 and is one of the few surviving welcome arches in the West. It’s also the gateway to one-of-a-kind shopping. Golden’s main street is lined with art galleries, candle shops, jewelry stores, bike/hike/raft and climbing stores, toy shops, hardware stores, women’s clothing shops, designer fashions…and don’t forget the Foothills Arts Center, where the Holiday Art Market is open seven days a week until Dec. 30 featuring the individual works of 100 different artists. If you’re looking for a special, unique gift, you’ll find it (along with free parking) in downtown Golden. Enjoy Holiday Cheer! Golden now has six award-winning craft breweries, a distillery and two dozen restaurants, including such classics as the Old Capitol Grille, which is housed in Colorado’s first capitol building; the Briarwood Inn, which re-creates an Old World European Christmas with massive decorations and old stone fireplaces; or the Sherpa House, which is a reproduction of a farmhouse from Nepal serving classic Himalayan dishes, such as yak stew. And down the block is Coors Brewery – the world’s largest single brewing site with free tours, free samples and a huge Coors gift shop for the beer lover on your list. Ride the Polar Express! The Polar Express steams into the Colorado Railroad Museum three times a night during the holiday season, whistle blowing, bell ringing and steam hissing into the cold air just like the movie. After the passengers board, the train chugs to the North Pole, where Santa hops on the train and gives everyone a silver bell. It’s the thrilling and memorable experience for kids – and adults. Even if you don’t ride the Polar Express, the museum also makes a great daytime holiday treat with model railroads (both indoors and out) and dozens of locomotives and railroad cars to climb on and explore.